We have a linen for your event with a wide assortment of styles and colors. 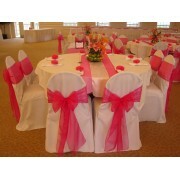 Our rental chair covers are designed to fit better, with quality fabrics. Select the colors & style to make your wedding, party or event a truly elegant affair.